completed in its entirety ~ simply attaching a listing will not be sufficient. which you believe to qualify, please enter the dollar value of the property at 100 percent of acquisition cost. SCHEDULE B. Inventory, Materials, Finished Goods, Consigned Inventory, Supplies. denial of the Freeport Exemption. SCHEDULE C. Machinery, Equipment and Fixtures in Process of Installation. 2017. The acquisition cost is to include the original cost, freight, trade-ins and other associated costs. SCHEDULE D. Other Personal Property. List all other property not elsewhere reported. Please list by year of acquisition and acquisition cost. property must be reported here. A rider must be attached to this statement showing the address of such buildings by year of construction. SCHEDULE F. Salvage Value Machinery and Equipment. not report these items on "Schedule A". SCHEDULE G. Pollution Control Facilities. 6A-3. A list of the approved pollution abatement control items is available from the Property Tax Division upon request. SCHEDULE H. Molds, Jigs, Dies, Forms, Patterns and Templates. market salvage value, whichever is less. Please complete the enclosed Worksheet for Molds, Jigs, Dies, Forms, Patterns and Templates. Those which are directly used in the manufacturing process are to be listed in item 1 (Specialized Manufacturing Production Property). with the return when filing. SCHEDULE I. Vehicles, Trailers, Boats, Aircraft, Mobile Homes and Rolling Stock. plates, are to be reported on this return. If additional space is needed for Rolling Stock, please use “Itemized Rolling Stock Report”. property at 100% of acquisition cost. sheet MUST be filed with this return. Failure to attach any of the requested information will result in the return being rejected. application must be filed with the office of the State Tax Department on or before the date the property is to be reported on this return. Please call (304) 627-2110 for additional information. 2. West Virginia Code states: All property returns must be filed as soon as possible after July 1 but no later than August 1.
one percent of the value of the property may be applied. schedule or fixed asset listing and balance sheet with the return. 6. 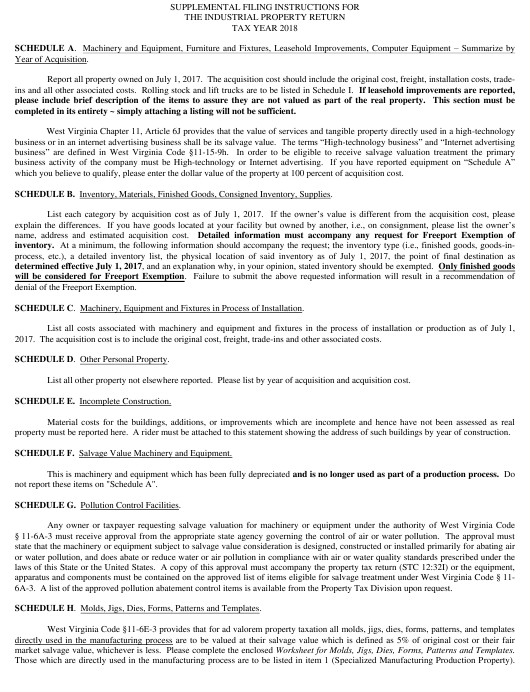 An individual return is to be filed for each industrial business location within the State of West Virginia.